Sri Lanka were bowled out for 253 before West Indies survived the last two overs unscathed. 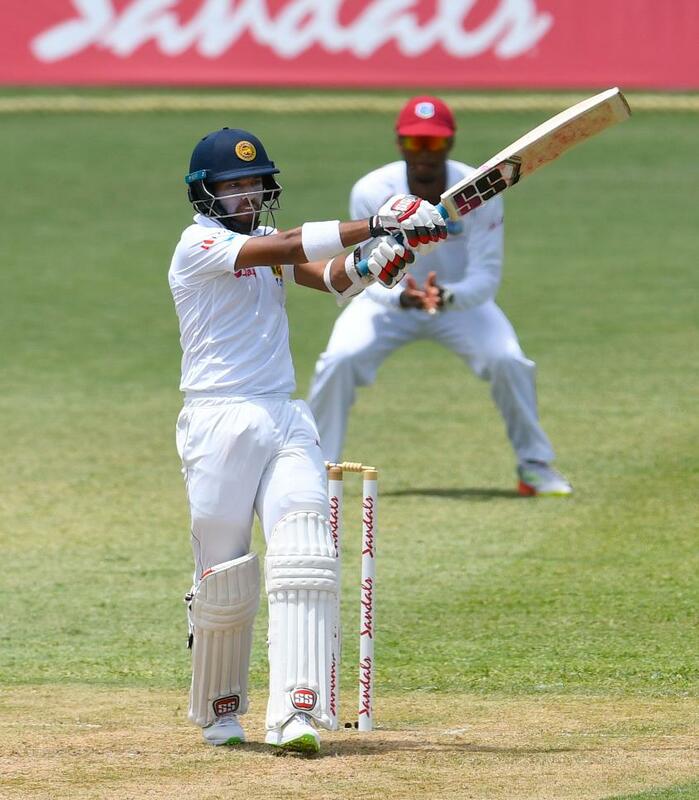 An excellent bowling effort, led by Shannon Gabriel, who claimed five wickets, meant West Indies ended the first day of the second Test at Gros Islet in charge, but a superb battling century from Dinesh Chandimal kept Sri Lanka in the hunt. West Indies’ decline as a Test side has been much-discussed, and perhaps over-emphasised. They have been capable of astonishing victories – Shai Hope's twin tons at Headingley, Kraigg Brathwaite batting through two innings without being dismissed at Sharjah, Gabriel running through Pakistan to defend 188 at Bridgetown – but they haven’t won consecutive Tests since in four years. If last week’s win wasn’t quite the match of any of those classics, it will claim a special place in the hearts of this team should catalyse the end of that habit. Typifying the West Indies in this period has been the mercurial Gabriel, capable of evoking memories of Caribbean pace bowlers of old one match, and then fading into the background throughout. Here, as in Port of Spain, he bowled with pace and hostility throughout. His dismissal of Dhananjaya de Silva was the day’s most eye-catching – quick, jagging back in, and crashing into an elbow on its way to the stumps - though the batsman's arm was in a sling, it apparently won't keep him out of the match. The delivery’s presence could be felt as Gabriel completed his five-for, with tail-end batsmen unwilling to attempt to stick it out and instead falling to loose shots. He received able support from new ball partner Kemar Roach, younger than Gabriel but the senior partner in all other ways. Formerly a tearaway who could rival the likes of Gabriel for pace, he has remodelled himself as a consistent, canny fast bowler, and as important as his four wickets, the first of which was his 150th in Tests, was his economy rate well below two-and-a-half an over. Even more astonishing was the parsimony of leg-spinner Devendra Bishoo, who conceded just 15 from his 11 overs. He may well have a greater role to play as the game wears on, but he has always been a spinner able to influence matches when conditions are in his favour; that he can contribute when they aren’t will hearten his captain Jason Holder. Despite his side ending the day in the ascendancy, Holder himself experienced a mixed day. 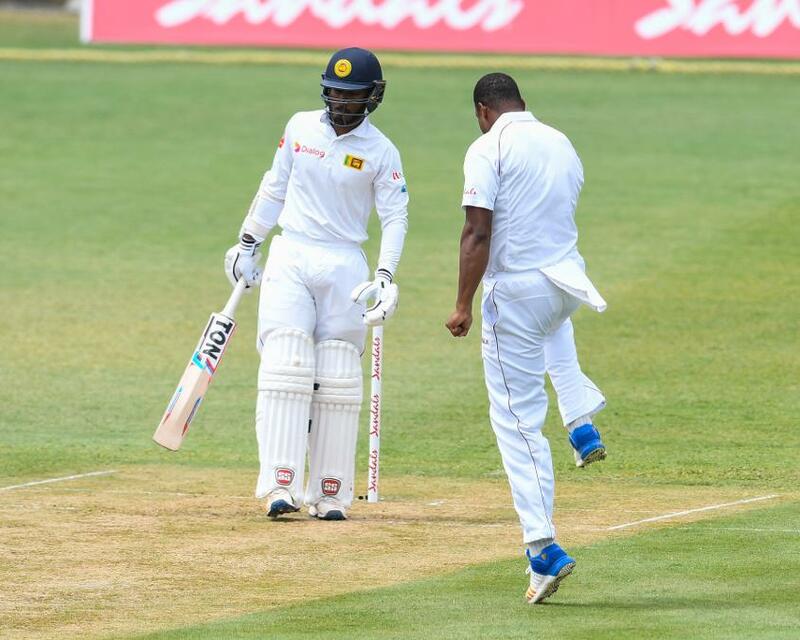 He started with a superlative catch, clinging on low at second slip as debutant Mahela Udawatte’s second ball in Test cricket, bowled by Gabriel, came on quickly, nipped away, and took the edge. Life will undoubtedly get easier. From that special start however, and despite Gabriel striking again in his third over, Holder took the perhaps-unwise decision to limit his opening bowlers to just four each. When he himself was struck for three consecutive boundaries by Kusal Perera it looked to have handed back the initiative to the Sri Lankans. Roach nicked off the same batsman with the first ball of his second spell to ensure West Indies remained in the ascendancy, but also to further call into question to wisdom of Holder’s choice. To further muddy the waters, Holder enticed Kusal Mendis, coming off a ton in the first Test of the series, to top-edge a pull shot, wicket-keeper Shane Dowrich taking a wonderful running catch. His counterpart, though his team struggled, enjoyed an unquestionably excellent day, compiling a gritty rear-guard century that just about kept his team in the contest. Running out of partners, an edge for four brought up the landmark in a style befitting a hard-fought innings. 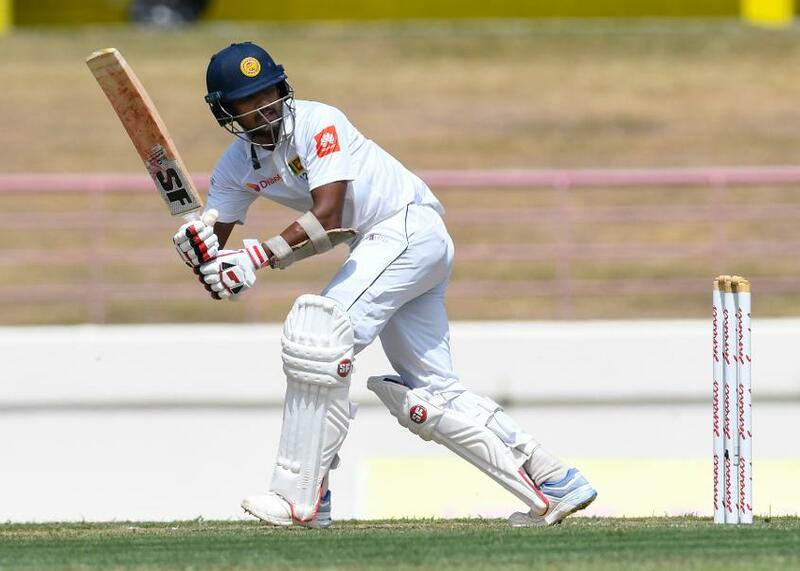 It was just his ninth boundary up until that point, though he added two more, including the day’s only six, in the company of No.11 Lahiru Kumara as he opened his shoulders in search of quick runs. His innings ensured Sri Lanka remained in the contest, instead of sliding to ignominy. But only when West Indies bat will its true worth be known.